Bimodal IT: What's Not to Like? Bimodal IT: What’s Not to Like? 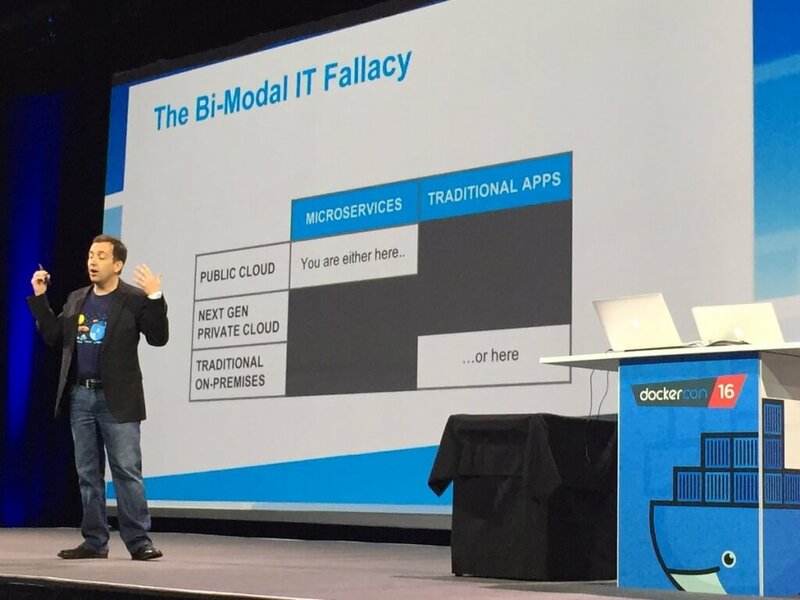 At his Dockercon 2016 keynote earlier this week, Ben Golub, CEO of Docker made a detour into eviscerating the idea of Bimodal IT, a concept introduced to the world by Gartner Research analysts Mary Mesaglio and Simon Mingay in July 2014. “It’s a big fallacy,” he said, referring to how the bimodal concept breaks enterprise IT operations into two distinct camps — those supporting legacy IT applications where change is slow and hampered by corporate policy, and those building new cloud-based apps, where change is driven at a quicker pace by business development. There is a lot of talk these days about Bimodal IT. Not all of it good. James O’Brien on his Point B and Beyond blog called it controversial, Forrester issued a report called “The False Promise of Bimodal IT,” and Jez Humble, wrote “The Flaw at the Heart of Bimodal IT” on their Continuous delivery blog to name a few. That’s a lot of opposition for a concept that is just 2 years old. The bimodal concept is simple enough and addresses how enterprise operations move from client-server architecture to the new cloud/container based technologies while simultaneously maintaining current operations. 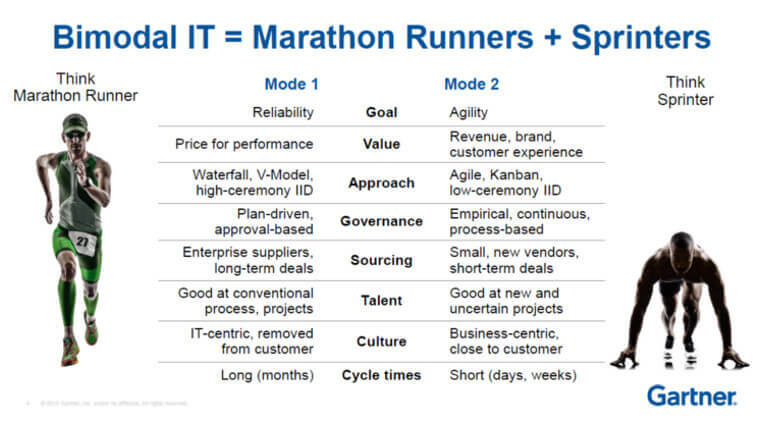 Gartner vice president and distinguished analyst Donna Scott, speaking at the recent OpenStack Conference, used the analogy of the marathon runner as traditional IT, maintaining standardized IT elements to keep the business as usual, and the sprinter, deploying parallel functionality while creating new and collaboration solutions. 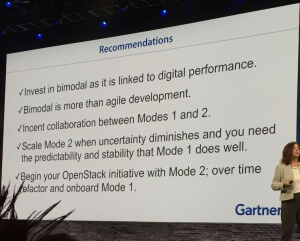 Relying on survey data, Gartner strongly recommends quick adoption of bimodal IT. Gartner’s Peter Sondergaard, senior vice president and global head of research, predicted that 75 percent of IT organizations will be bimodal in some way by 2017. Scott told the OpenStackers that executives surveyed expected 41 percent of revenue would come from digital business by 2020. “CIOs can’t transform their old IT organization into a digital startup, but they can turn it into a bimodal IT organization,” Sondergaard said. And yet during a presentation at the recent RSA Conference, the keynote session, then mention of bimodal IT elicited audible groans and a few cat-calls, from the audience. 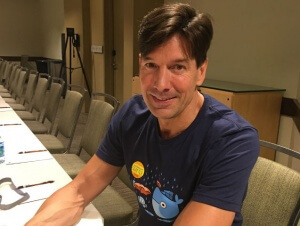 “I think the bimodal IT classification nicely captures the lift-and-shift that legacy applications that aren’t being modernized for the cloud and maybe never will be, as well as the cloud native applications going right for microservices and containers,” — Mark Russinovich, Microsoft. For example, earlier this year LinkedIn launched a re-build of their mobile app. Their new pipeline is completely automated, and new code is goes live three times per day, with no more than three hours between when code is committed and when that code is available to members. With techniques such as these, where’s the need for bimodal IT? Well, for one thing, not all companies have the 270 or so engineers to create this kind of automation that LinkedIn used to get this up and running. For another, LinkedIn’s infrastructure was launched in 2002 and thus did not have as far to go as other legacy companies. According to Gartner, bimodal IT is for enterprises with old-school (read client/server) architecture and who need to move to more responsive architecture. Many people dismissing bimodal IT are are so much on the cutting edge that they get inpatient with the rest of the world not catching up. They living in the future, creating the future, really. But there are people in corporations’ upper management who remember the nightmare of moving from a mainframe environment to client/server architecture. Large and even mid-sized companies are slow to make changes, even when it makes tons of sense to the new guard that they need this functionality yesterday. People attending conferences for cutting edge technology may think this is a no-brainer, but there are historical reasons that upper management at a large company sees IT as a financial sinkhole. Or a mid-sized company may not have the person power to completely restructure their IT department with new software, yet again. More than a few companies, including government agencies and banks, are still using COBOL on mainframes, because it works. In many cases, it worked just fine until the 1990s brought new software (*cough* Peoplesoft *cough*) that made them move away from mainframes. There are, we know from experience, managers who are still resentful of this. In tech, memories are short, the past is the past, and the need is to move on to faster, better, more. More servers, more containers, more memory, more software, more apps, more people. Always more, different, faster. But Finance has long memories and the past is what matters because the past in the foundation on which to make decisions. How much was spent? Was the expected ROI in fact realized? Why not? How much overhead was added? How much of the hardware/software costs can be amortized? You want MORE? Why can’t you manage with the servers/memory we already bought for you? If it’s in “the cloud,” why am I paying for it? “Mode 2 tends to be these things that were traditionally known as ‘shadow IT,’ where it ends up being the end users themselves that take that challenge on. They say, ‘The things the corporation is giving me to do my job isn’t exactly fitting my needs. So I need to do something else to fill a gap,’” said Marcus Schmidt, senior director of product management at hosted communications provider West IP Communications. Bimodal IT is about incorporating and standardizing this shadow IT and allowing the innovators to innovate, but within corporate structure. It is not suggested for every company, and especially not for companies that are already doing agile. Nowhere is it suggested as a destination, but as a means to an end. Add to this, large companies move slowly to adopt change. For example, PayPal has a huge initiative underway to move to using Innersource as way to manage internal software projects. The company is completely re-structuring the way it works. Paypal started this initiative two years ago, about the same time that Gartner created the idea of bimodal IT. What bimodal IT is all about is maintaining the current functionality while moving into the future. And for some, the future can’t come fast enough. TNS Managing Editor Joab Jackson contributed to this report. Feature Image: Docker CEO Ben Golub at Dockercon 2016. Photo by Solomon Hykes.